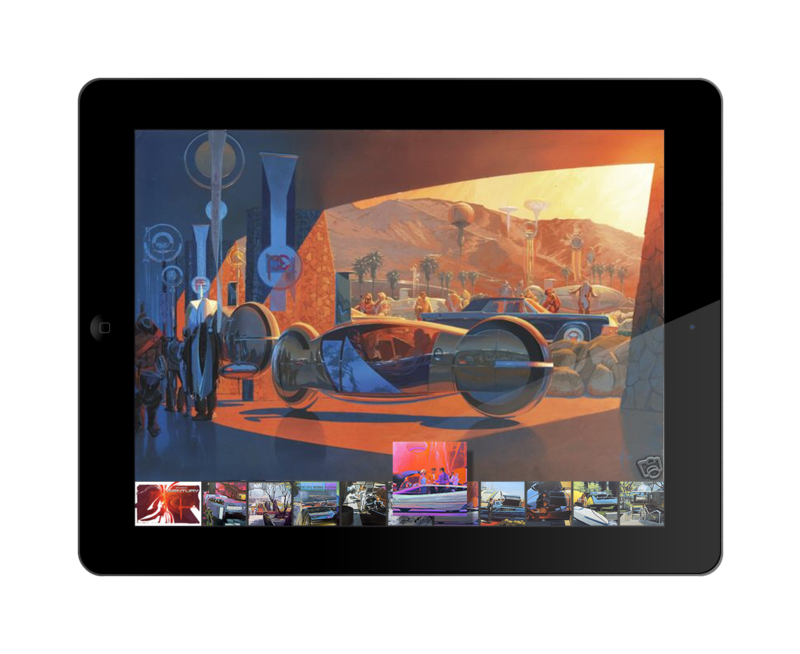 For more than four decades, Syd Mead’s imagination and illustration has graced many forms of media – from motion pictures, television and industrial design, to architecture and electronic media. Awareness of Mead’s work has been largely driven by movies such as Aliens, 2010, Tron and notably Ridley Scott’s Blade Runner; however connoisseurs and fans have come to regard printed collections of his work as the definitive artefacts of Mead’s career. As part of an internal research programme in 2011 exploring the future of books (Books As A Place), Carbon approached Mead with a view to interpreting his 2001 collection Sentury as an augmented edition and the possibilities and opportunities afforded by the creation of collectible, interactive editions. We oriented Sentury around three principles: to showcase the works at the highest resolution; to “peel back a work” and augment with additional media such as sketches, audio commentaries and video; to provide multiple narrative routes through the collection.